This Article was written by Mike Martin and it's inclusion in Shop Talk was suggested by Airtime. Every time the rear tire is changed, it is time to replace the three O-rings which keep the moly paste in place. Two of the O-rings are immediately found, but one is not so obvious. Part number 91358-MG9-003 (50.5mm x 3.5mm) goes in a groove adjacent to the splines on the final driven flange. Part number 91304-KT8-003 (61mm x 2mm) goes on the shoulder of the wheel. An alternate number is 91302-MA6-003. 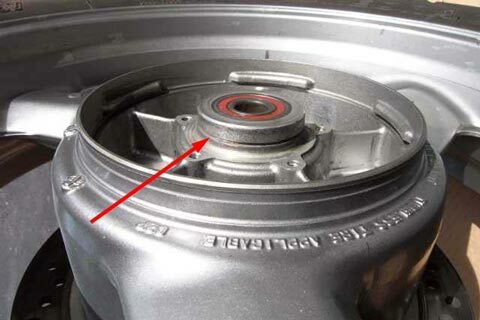 You will see this one when you pull the final driven flange off the wheel. Part number 91356-MG9-003 (39.5mm x 2.4mm) is the elusive third one. 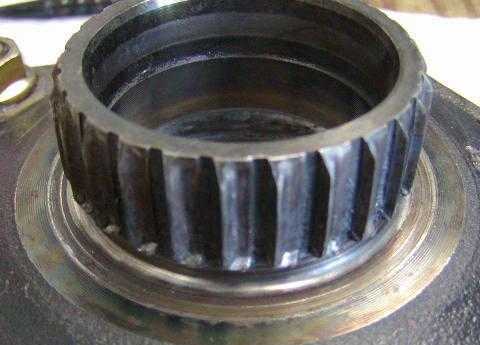 It is found in the final drive, where the final driven flange splines mate up to the ring gear splines. In the picture, a small screwdriver is shown stretching the O-ring a bit. In case you need a reason to religiously replace the O-rings and lube the parts with Moly paste, here's what happened to Mike Sumner's splines. Contrast them with those in the first picture. $$$$$$$! Last updated on February 2, 2004 © 2004 M. E. Martin, all rights reserved.